This past April 9, the anniversary of Bolivia’s National Revolution of 1952 came and went as usual—with no official recognition and scarcely a mention in the domestic press. 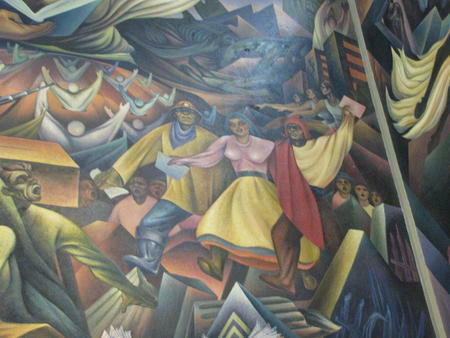 This historic event, in which workers and peasants overthrew an entrenched oligarchy of tin barons and landholders, was the first successful revolution in Latin America after Mexico, and is viewed by most contemporary scholars as a transformative moment for Bolivia (and Latin America). 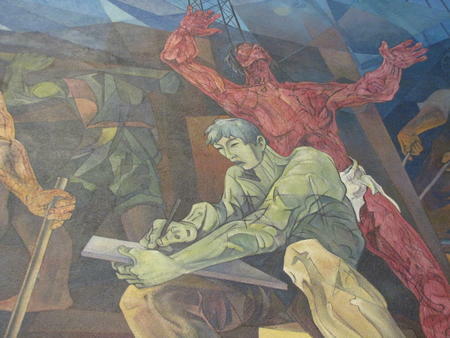 Mural - Museum of the National Revolution. Credit: Ben AchtenbergStill, successive Bolivian governments—including the leftist government of Evo Morales—have relegated the episode to the dustbin of history. A look back at the earlier revolutionary experience helps to explain this seeming paradox—and also reveals how the events of 1952 have profound and continuing relevance for the present. The Revolution of 1952 is closely associated in Bolivia’s popular consciousness with the Nationalist Revolutionary Movement (MNR), the political party that led and inherited it. The immediately precipitating factor was the military’s annulment of the presidential elections of 1951, which the MNR candidate had won by a landslide. Armed workers, led by the militant miners union, joined with dissident national police and MNRistas in a three-day urban insurrection, routing the military junta from La Paz. In the rural highlands, peasants aided by miners occupied vast estates and instituted self-help land reform. A far-reaching agrarian reform program—implemented with the help of Mexican advisers—dismantled feudal haciendas in the western highlands, abolished the hated system of forced peasant labor, and redistributed expropriated lands to indigenous peasants through their sindicatos and communities. Universal suffrage (without literacy or property requirements) extended the vote to peasants and women, expanding the electorate from 200,000 to more than one million virtually overnight. Education was declared universal and free to all. But by the mid-1950s, the MNR had called a halt to, and partially reversed, its radical reforms—thanks in large part to U.S. counter-revolutionary pressures (which were not unwelcome by the party’s conservative wing). In response to falling tin prices and a deepening economic crisis, the MNR signed a long-term contract obligating the United States to purchase Bolivia’s tin, and accepted massive U.S. aid. By 1960, Bolivia was the largest recipient of U.S. foreign aid in Latin America, at the highest level per capita in the world. One-third of Bolivia’s budget was financed directly by the United States. In exchange, the MNR agreed to compensate the tin mine owners (whose investors included some U.S. interests) and open up Bolivia’s hydrocarbons sector to U.S. and other foreign petroleum companies. Agrarian reform was limited to the western highlands, leaving the eastern lowlands open for private agribusiness expansion through patronage land grants. 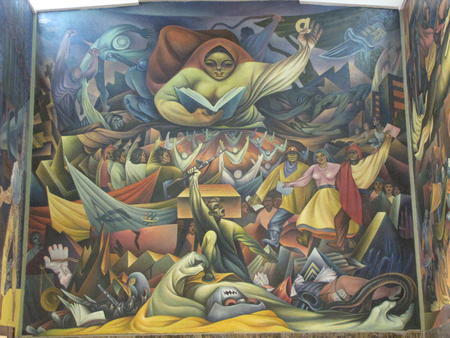 Mural - Musueam of the National Revolution. Credit: Ben AchtenbergA U.S.-dictated IMF bailout plan imposed an austerity program that balanced the national budget on the backs of Bolivian workers— freezing wages, ending price controls and consumer subsidies, and slashing hard-won union benefits. In addition to redirecting the Revolution’s economic priorities, the United States pressured the MNR—which it viewed as a critical bulwark against a communist takeover in Bolivia—to abandon its left-wing factions. The COB was marginalized, and the reconstituted military was used to repress the militant mineworkers who had brought the MNR to power. With U.S. encouragement, the MNR solidified its ties to an increasingly complacent peasantry and turned campesinos against their former mineworker allies, an arrangement that later ripened into a formal “military/peasant alliance.” The MNR’s rightward shift eroded its popular support, paving the way for a U.S.-supported coup in 1964 followed by 18 years of military dictatorship. “In the end,” writes political scientist Stephen Zunes, “the United States was able to overthrow the revolution without having to overthrow the government.” The successful manipulation of economic leverage and dependency to achieve U.S. foreign policy goals in Bolivia —short of the covert military tactics employed in Guatemala during the same period—established a useful precedent for subsequent interventions by the United States and allied international financial institutions throughout Latin America. Still, the experience of the earlier revolutionary period continues to shape Bolivia’s political trajectory and offers important lessons for today. As historian Sinclair Thomson has noted, the Morales government’s own political program—including the reassertion of state sovereignty over natural resources and strategic sectors, and the extension of agrarian reform—builds on the MNR’s early popular agenda, with the important addition of decolonization and refounding the plurinational state. The existing dual structure of land holdings, with “minifundios” in the western highlands and “latifundios” in the eastern lowlands, is a legacy of the earlier revolutionary period that is a major source of social conflict in Bolivia today. The critical role of popular insurgencies and the need for alliances among diverse social sectors in achieving political gains is another enduring lesson of 1952. In 2003-5, the convergence of social movements across sectoral, geographic, and urban/rural lines that was instrumental (even more so than in 1952) in bringing a leftist government to power found expression in a "Unity Pact" among Bolivia’s five major popular organizations. Today, divisions between highland and lowland indigenous groups, on the one hand, and campesino-identified sectors—especially over the government’s plan to build a highway through the TIPNIS national park—have effectively ruptured the Unity Pact, posing a major challenge to the Morales government and to the future of Bolivia’s revolutionary process. 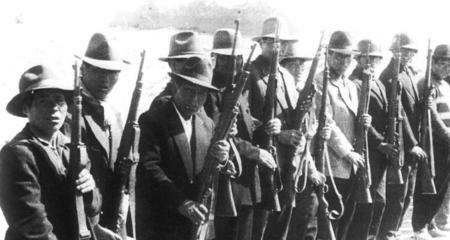 Peasant and worker militias. Credit: La Razón.Bolivia’s relationship with the United States, of course, is radically different today than it was in the 1950s, thanks to the erosion of U.S. hegemony in the region and the emergence of regional trading blocs and alternative funding partners. After three years of extremely frayed relations, following the countries’ mutual ouster of ambassadors in 2008, Bolivia and the United States have recently restored diplomatic ties through a “framework agreement” that emphasizes collaboration and mutual respect for national sovereignty. Still, since Morales took office, U.S. aid to Bolivia has declined markedly—from $137 million in 2005 to less than $20 million proposed for 2014. Funding for economic and social programs has declined from $93 million to just $14 million. As of 2009, the loss of trade preferences that allowed Bolivia to export textiles and other products duty-free to U.S. markets had cost Bolivia an estimated 9,000 jobs, plus $8 million to subsidize U.S. tariffs for domestic manufacturers. One way or another, it seems, the United States continues to exact its price. 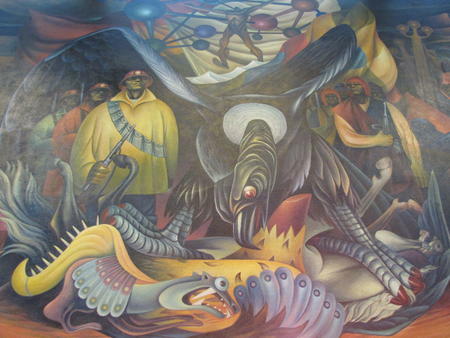 For now, official memories of the Revolution of 1952 can be found at the Museum of the National Revolution in the Miraflores district of La Paz—somewhat off the beaten track, with irregular hours, but well worth the trip to see the amazing murals depicted here. See Proclaiming Revolution: Bolivia in Comparative Perspective, Merilee Grindle and Pilar Domingo, eds, David Rockefeller Center for Latin American Studies, 2003. This discussion draws generally on Proclaiming Revolution (op. cit.) and Herbert S. Klein, A Concise History of Bolivia, Cambridge University Press, 2003. Brooke Larson, “Commentaries on the Panel: ‘The Bolivian Revolution Revisited,” LASA Congress, October 7-10, 2010, Toronto (unpublished).